Your Irish Coat of Arms is hand-painted on our best-selling knight copper shield, sized to bring your family surname more vividly to life in all its historic color. Each family coat of arms is carefully researched, then hand-painted by a master artist with durable oil-based enamels for vibrant color and lasting finish. European craftsmanship is throughout with copper shields forged in the renowned Clissold metalworks. Simply provide the family surname (and country of origin, if known), and we’ll do the rest, researching an extensive library to bring your family history to life. 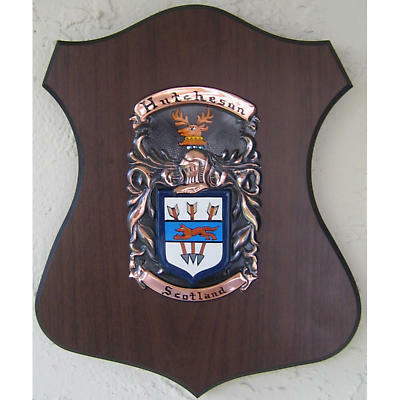 Family surname is hand-painted at the head, while the family motto or country of origin is added to the base of the shield, and then placed on a walnut wood display, for proud display in your home or office. Finished size is 13”h x 9.5”w. All nationalities are available!